Master Palekh artist Mikhail Nebogatov was born in 1954 in Teraspol, Moldavia. He studied at art school there where he was noted for his sculpture work. 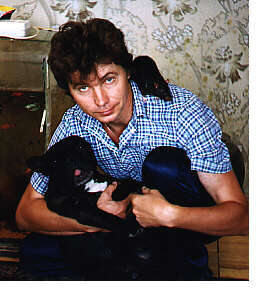 In 1975, he graduated from the Folk Krupskaya University. In 1980, he graduated from the Palekh art school. His works have been shown at such exhibits as "Palekh Anniversary - 50 Years" (Palekh, 1980) "The Youth of Russia", (Moscow, 1982), "In Memory of Tsiolkovskij" (Kaliningrad, 1985). 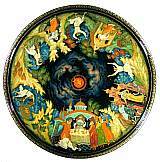 He has boxes in the Palekh Museum, as well as in the book "Russian Lacquer, Legends, and Fairy Tales". Nebogatov's style is strong and mature. He is very serious about composition and precise in his details. 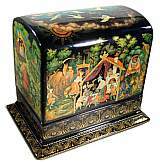 Nebogatov has a penchant for creating spectacular works (see the "Sleeping Beauty" box, page 60, in "Russian Lacquer, Legends and Fairy Tales, Part II") often letting the main events of an entire fairy tale unfold on the surface of the box. This is in keeping with a tendency from iconography where painters showed the lives of Jesus, Virgin Mary, Saints, etc. in different sections and panels of the icon. Along with painting lacquer miniatures, Nebogatov paints and restores icons, murals, and watercolors. Nebogatov is a very polite and modest gentleman. His hobby is fish - he has six aquariums! Search results:Page 1 of 2 total pages with 27 results. 6.00" x 4.00" x 4.75"
1.75" x 1.00" x 1.00"
2.00" x 1.25" x 0.88"
1.25" x 2.25" x 1.50"
1.38" x 1.00" x 0.75"
4.00" x 3.00" x 4.75"
6.25" x 4.00" x 1.50"
5.25" x 2.63" x 8.13"
2.75" x 1.25" x 1.00"
3.50" x 1.00" x 0.88"